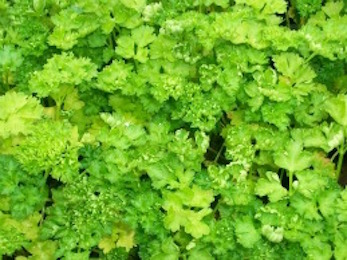 The parsley herb is one of the most essential herbs in any collection. It adds flavour to any dish and pleases the eye as a garnish. It's a valuable source of Vitamins A, B and C and iron and other minerals. 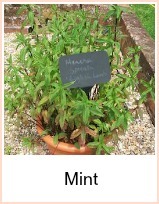 It is also a mild diuretic and has been useful in the treatment of rheumatism and fluid retention. Parsley takes a long time to germinate - 5 to 8 weeks - it's rumoured it goes to the devil and back 7 times before it germinates, but I don't believe that... Pour hot water onto the soil just before sowing - the heat will help germination. It's suitable for growing indoors as well as out - it's a biennial, but it goes to seed in its second year and you'll need to sow fresh every year. Sow a succession in March, May and July - overwinter outdoors by protecting with a cloche or a piece of polythene pegged down. It is difficult to dry parsley - it needs a temperature of around 200F or 95C in an oven - rinse, shake dry and lay over a mesh - then leave the oven door slightly open until the parsley is brittle. Break it up and store in light proof jars. Harvest and rinse - shake dry and seal into poly boxes or bags. Alternatively, chop it finely and pack into ice trays - cover with water and once frozen, turn out into bags. Use the ice cubes as you would a tablespoon of fresh chopped parsley in cooking dishes. 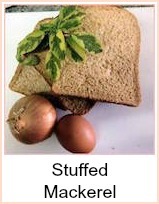 Don't forget to label it - one green herb looks much like another in the freezer. Well - there's parsley sauce, parsley butter - parsley with everything that has garlic in it - garnish with parsley. Heat a pan of oil - whilst you're doing this, rinse and dry your parsley sprigs. Pop the parsley into the oil for just 30 seconds and use to garnish any plain baked fish or seafood - delicious and crispy. Take a handful of parsley and put it into a bottle of olive oil - leave three weeks or so for the flavours to infuse. 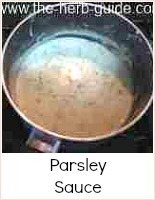 Then use it in cooking where parsley is an ingredient of the finished dish to further enhance the flavour. Take a handful of chopped parsley and mix into 4 oz (100g) butter. Roll the butter into a sausage shape and then chill in the fridge for about an hour. Cut the butter into discs and pop onto plainly cooked fish or seafood - also onto cooked peas and other vegetables. 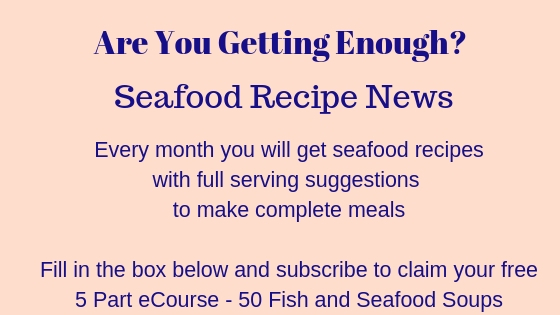 Parsley Sauce is a mainstay of fish and seafood cooking - it makes the blandest of fish taste superb - there is a recipe for parsley sauce in the 'seafood sauces' section on the navigation bar - loads of ideas for fish sauces there. You can use parsley sauce in a fish pie by mixing prepared fish into it and then putting it into the base of an ovenproof dish - cover with mashed potato and bake in a moderate oven for about 30 mins.